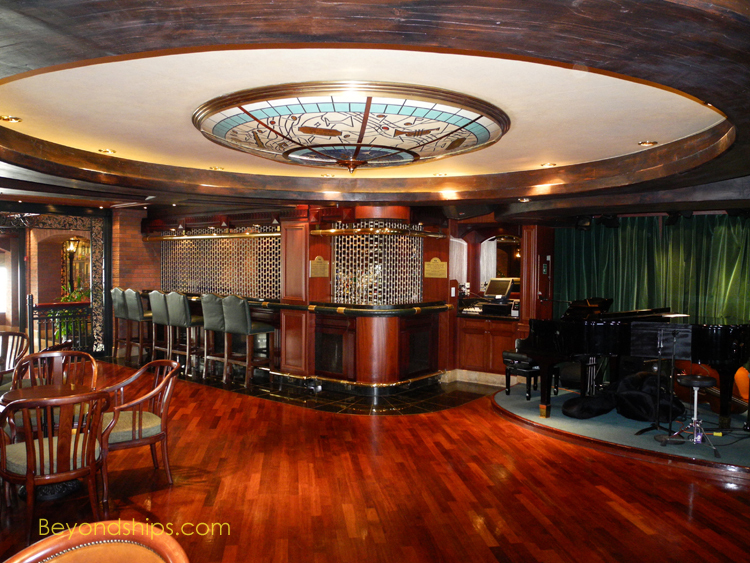 Below: In addition to the dining area, The Bayou Cafe has a bar area with a large dance floor. 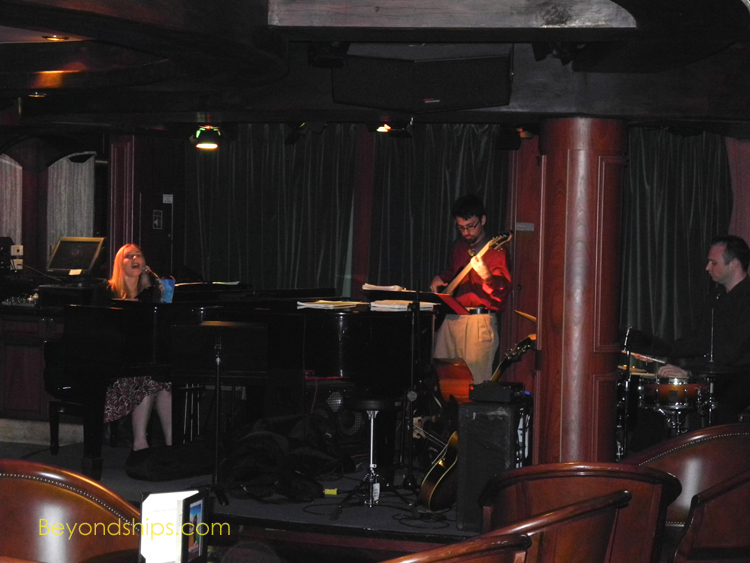 Above: The Adrienne Hinmarsh Trio playing jazz standards in the Bayou Cafe. Above: An appetizer sampler plate. Below: The Bayou Cafe's gumbo. Above: A surf and turf combing Bourbon-smoked Porterhouse steak and Red pepper Broiled Lobster. Below: A dish of traditional New Orleans sides. Below: Fried yellow peach pie. The Bayou Café is a specialty restaurant unique to Princess Cruises’ Coral-class ships - - Coral Princess and Island Princess. Its theme is New Orleans, paying tribute not only to the city’s cuisine but also its music and style. You approach the Bayou Café along the Deck 7 indoor promenade. After passing the Italian specialty restaurant Sabatini’s, the décor of the promenade changes and you find yourself on a New Orleans street. There are street lamps, red brick walls and wrought iron trim around the windows. Cityscape murals and shuttered panels similarly recall New Orleans. The entrance to the restaurant is under a large portico and is flanked on either side by street lamps. Inside the large room is dimly lit. The tables and chairs are dark wood and the walls are dark brick. The Bayou Café is both bar and restaurant. A wrought iron balustrade separates the dining area from the bar section, which has smaller tables and a dance floor. Next to the bar is a small stage on which musicians perform. With this venue’s New Orleans theme, the music that is played could only be jazz. It is not limited, however, to New Orleans jazz but extends across the range of jazz styles. On one visit, the band was a trio with a singer who sang her adaptations of songs made popular by Frank Sinatra, Tony Bennett and other crooners. On another visit, the music was entirely instrumental improvisation. The meal began when the server brought a basket of Johnny Cakes and cheese biscuits. He then explained the menu using a cart with several plastic-wrapped cuts of beef to illustrate his discussion of the various steak offerings. One of the things that makes dining in a specialty restaurant worthwhile is having a server who can talk knowledgably about the restaurant’s offering. Throughout the meal, the service was prompt and responsive. Heading the list of starters is “Smoked Gator Ribs.” Yes, this is made with real alligator meat. No, it did not taste like chicken to me. While the meat had the consistency of chicken, it has its own flavor. It is not a strong flavor, however. Consequently, the dish gets most of its flavor from the rather good barbeque sauce with which it is coated. Oysters Sueur de Bienville, my server said, was the most popular of the starters. In this dish, the oysters and shrimp are cooked together along vermouth, onion, garlic and Parmesan cheese. Quite tasty and not at all rubbery. The Mardi Gras Peel-n-eat Shrimp Piquant, which is done with cayenne peppers, had a fiery Louisianan flavor. However, as the name indicates, you do have to peel the shrimp. Since they are covered with sauce, your fingers - - the only practical implement for peeling shrimp - - become somewhat messy. Accordingly, a finger bowl with lemon is provided. My favorite of the starters, however, was the Sausage Grillades. These were spicy and full of flavor. For the next course, the menu gives the choices as a cream soup, N-Awlins Crawfish Mug Bug Bisque, or a salad. But, another alternative is to order a small bowl of Seafood Gumbo Ya-ya, which is listed as a seafood main course. This is a fiery stew that includes crayfish, crab leg, scallops and shrimp as well as rice and vegetables. While perhaps not as spicy as the New Orleans original, this gumbo is powerful. In addition to the gumbo, for the main course, the Bayou Café offers such New Orleans specialties as Flambeaux Grilled Jumbo Prawns, Corn Meal Fried Catfish and Blackened Chicken Brochette. 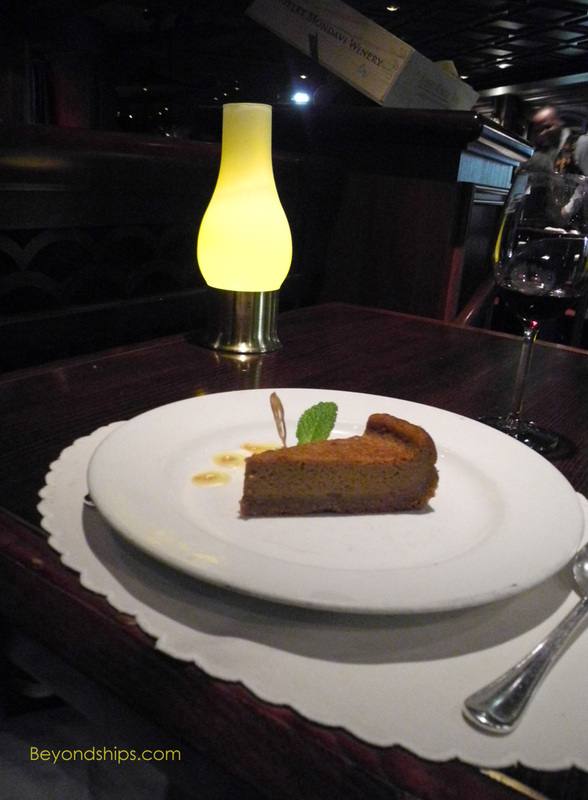 But, the Bayou Café also goes further and combines New Orleans cooking with steak house fare. The steak offerings use the same quality beef used in the steak houses elsewhere in the Princess fleet But they are prepared New Orleans style. For example, the New York strip steak is prepared with mustard and blackened with spices. Similarly, the Porterhouse is Bourbon-smoked and chili-marinated. The New Orleans preparation did not have a noticeable effect on the Porterhouse steak that I had. But the flavor was enhanced by judicious use of the three gourmet spices that were served with the steak. These were the same three salts that are used in Princess’ premium Crown Grill steak houses. They include a black “volcanic” salt from Hawaii, a mango flavored salt, and an apple, smoky flavored salt from Washington State. For an additional five dollars over the normal cover charge, you can have the Red Pepper Broiled Lobster as a main course. 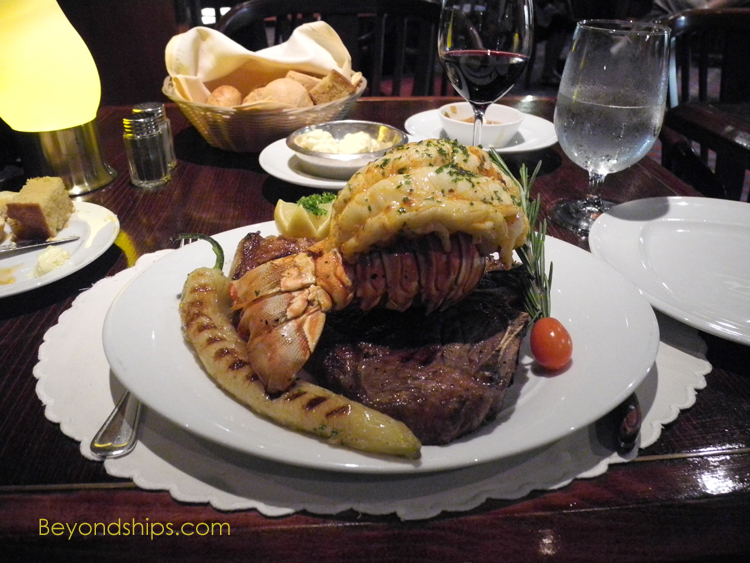 This was one of the largest lobster tails that I have seen on land or on cruise ships. Although large lobsters tend not to be as tender as smaller ones, this one’s sweet flavor made it a delight to consume. (The lobster can also be ordered in combination with one of the steaks for a “surf and turf”). The Bayou Café makes it easy to become full before the time for dessert comes around. Nonetheless, the restaurant has several dessert offerings. Although I liked the graham cracker crust of the sweet potato pie, I found the more fruity fried yellow peach pie to be a better change of pace from the earlier courses. I was favorably impressed by the Bayou Café. 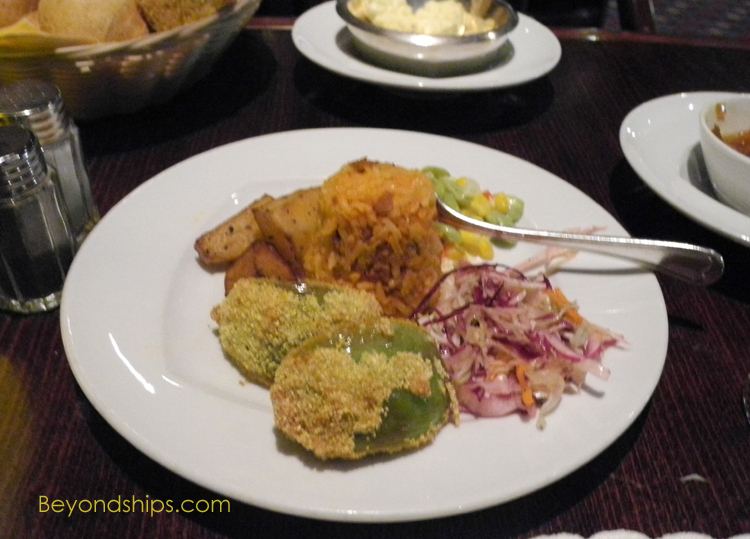 New Orleans cuisine is not something that you find very often on cruise ships. But beyond its novelty, this is a good specialty restaurant. Furthermore, the live entertainment in a casual setting makes for a relaxed enjoyable experience. The Bayou Café is open for dinner each night and for lunch on sea days. There is a $20 cover charge. 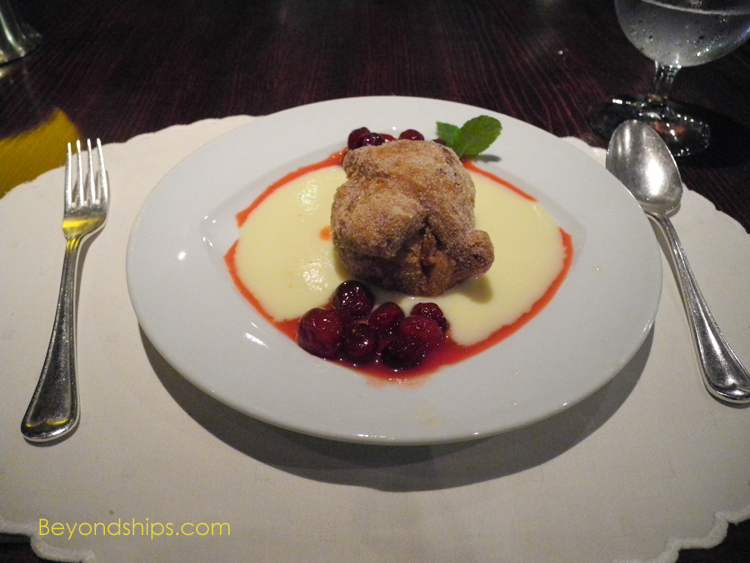 Click here for a review of Breakfast at Sabatini's on Island Princess.